Technical Car Experts Answers everything you need: crack on the trunk lid corners of honda Motorcycle? crack on the trunk lid corners of honda Motorcycle? Saddle bags are ABS Plastic. Some of the folks have sanded across the crack on the inside then mix some plastic shavings with plumbers cement for pvc pipe. Take this slury and spread it across the crack. That is the same techinque that is used for pop-up camper roofs. 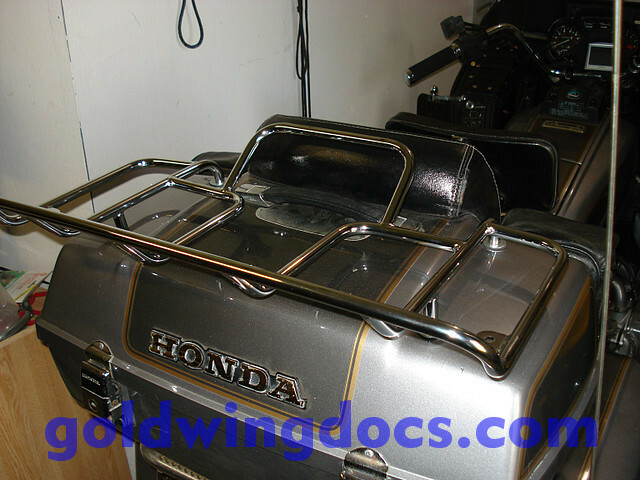 I had wanted to add a trunk rack to my bike for some time - primarily, for camping purposes, to allow us to carry a tent or other things that are too large to fit in the trunk or side bags. 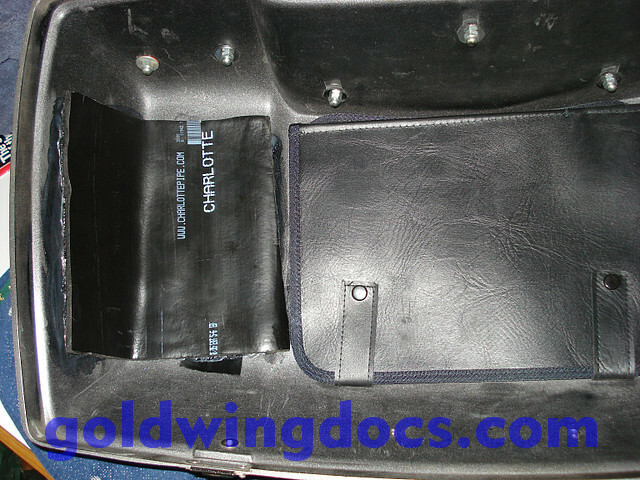 However, I was always worried about the thin ABS plastic that the trunk was made of - I had images in my mind of the trunk rack punching right through the hard-to-find plastic trunk lid. I finally decided to go ahead and get the job done. The trunk I used came from cycle max ohio. I decided that in order to mount the thing, I would first reinforce the trunk lid, to allow it to better carry the load that would be placed upon it. 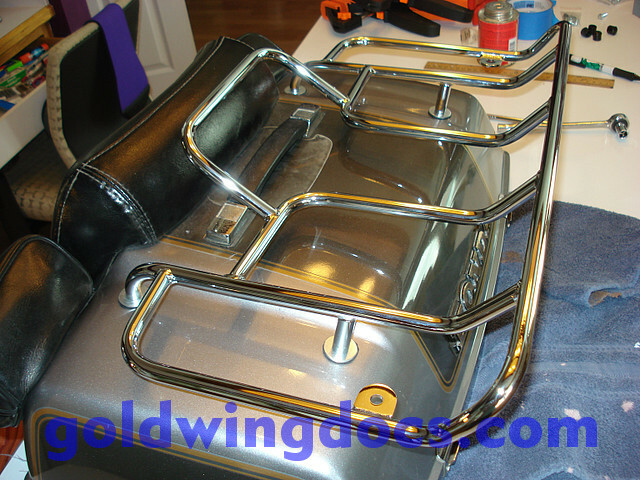 The trunk lid can be easily removed . You open the lid all the way, then slide it gently to the right. The hinges will release, and the trunk lid will come free. I put some towels down on the kitchen counter, and placed the trunk lid upside down on them (more on the kitchen momentarily). 1. 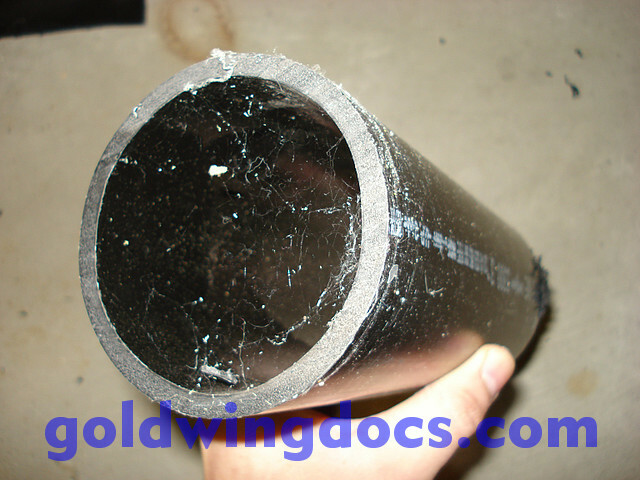 To start with, purchase a three-foot length of 3 inch diameter ABS pipe. Mine had 1/2 inch thick walls, and was over twice the thickness of the existing trunk. Make sure it is ABS - all of the plastic fairings on the bikes are ABS, and attempting to bond a different type of plastic to them won't work. Cut two 8-inch sections from the pipe, and then cut each 8-inch section lengthwise, so the pipe has a slit down the side. Ignore the cobwebs. 2. The next couple steps I do not have pictures for, for fear of incriminating myself should my wife somehow stumble across them. Heat up your kitchen oven to 300 degrees, line a cookie pan with non-stick tin foil, and put the pipe with the slit in it on the pan. Allow it to warm up for a few minutes until it starts to soften. Gently pull it apart at the slit, until you can get it to the point where it is more flat than round. Then let it warm for a good five minutes in the oven, until it is the consistency of rubber. You'll need gloves at this point to handle it - it will be hot! I also recommend that you run the kitchen exhaust fan while doing this if you don't wish your wife to question you about the smell of burnt plastic hanging in the kitchen. 3. 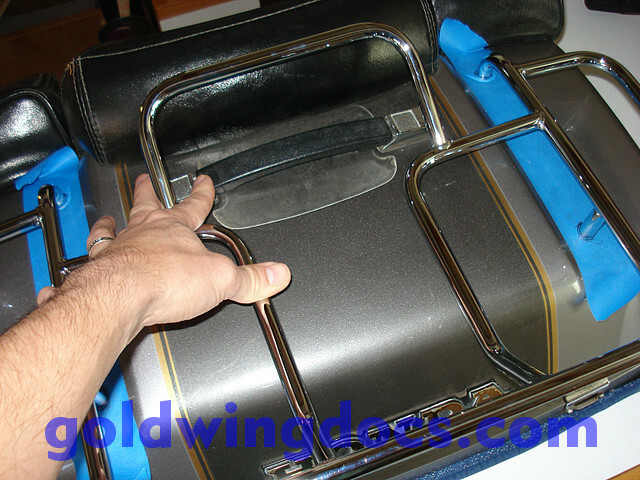 Take the ABS piece from the oven, and form it into the inside of the trunk lid - do this quickly before it can harden! Use some old towels (or some good ones, if your wife is out of town, like mine was) to push the plastic into the lid - use some force! The towels will a) insulate you from the heat, and b) press the hot ABS with equal pressure into all the curves and folds of the inside of the lid. Hold it in place for a good minute - after this point, it will have hardened, and taken on the shape of the inner contours of the lid. Repeat this for the other side of the lid. 4. Scrape the paint off the inside of the lid where the ABS reinforcement will bond. Coat the inside of the lid and the reinforcement LIBERALLY with ABS cement. Push the reinforcement into place, slide it back and forth a couple times to make sure the cement is equally distributed, and clamp TIGHTLY. I used wood clamps to clamp the sides, and a 40 pound bag of sand to apply pressure to the top. The ABS cement says it needs two hours to cure, but I found it took more like four hours. When cured, remove the clamps and repeat on the other side. There should be no gaps between the reinforcement and the lid anywhere - it was formed to the shape of the lid, before it hardened, so it should fit perfectly, as shown in the picture above. 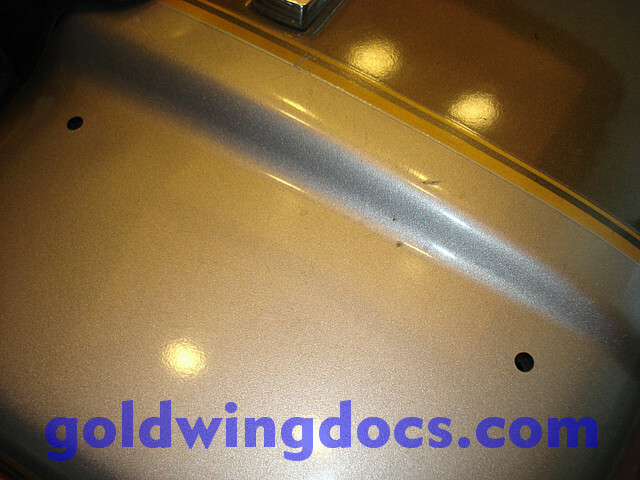 You'll notice now that the trunk lid is a fair bit more stiff than it was before, simply because of the strength of the new plastic that has been added to it. 4. Take some painter's masking tape, and mask off the top of the lid where the rack feet will be fastened. This is both to mark the drilling locations, and to prevent burrs and paint lifting while drilling. Center the rack and make sure it is positioned exactly where you want it to go, then draw around each foot on the masking tape. 5. Remove the rack, and you should have perfect circles where each foot was located. 6. 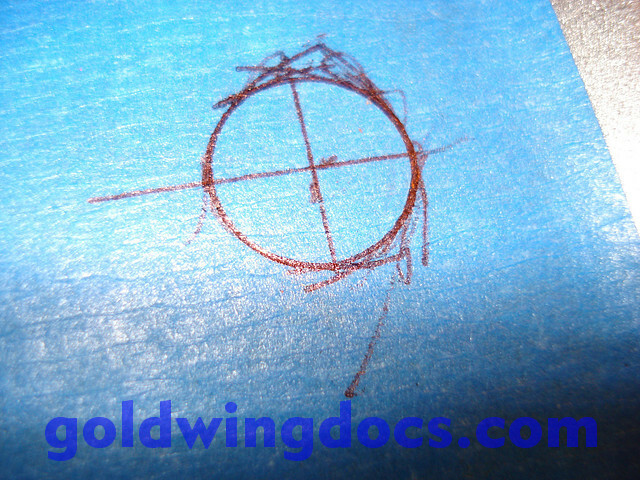 Measure the center of each circle and draw crosshairs, to locate your drilling position. 7. Drill using a small diameter bit first, to ensure you drill the exact position you want, then use the correct size bit for the machine screws you will be using. Keep in mind that the holes need to be perpendicular to the GROUND, not to the curve of the lid. Put the trunk rack on the lid and have a look at the angle of the feet - that's the angle you'll need to drill the holes to, or else the machine screws will not line up correctly. 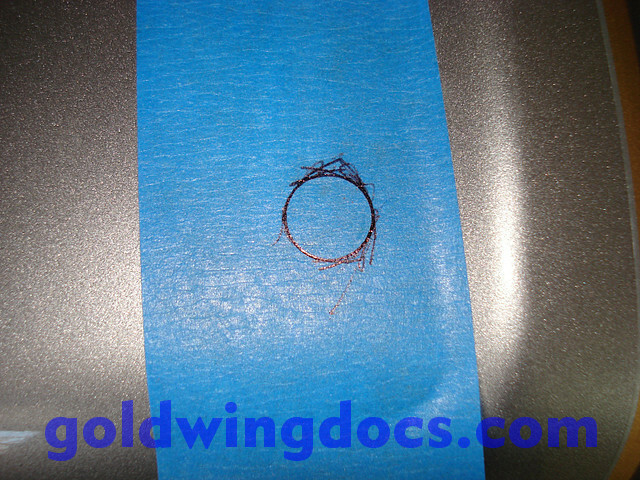 When finished drilling, remove the tape. 8. 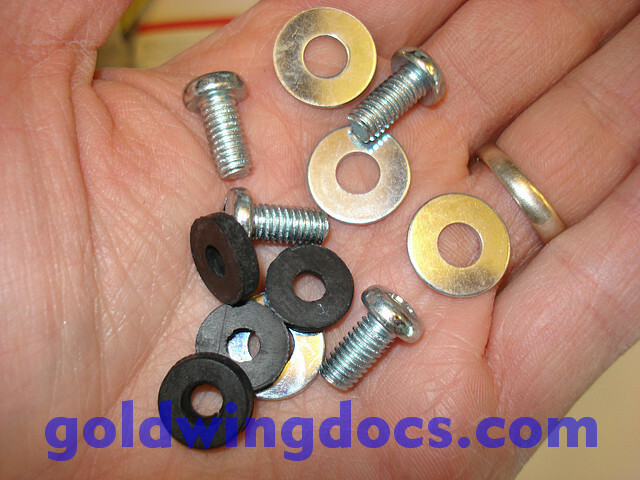 The fastening hardware that the rack came with is good, but I was a little worried about the size of the washers. I didn't want the rack feet punching a hole through the lid. Also, with the ABS reinforcement in place, the supplied screws were not long enough. 9. I went to the hardware store and bought longer (1.5 inch) screws (this rack uses standard M6 thread screws), along with one-inch fender washers and matching rubber washers. This spreads the load over a much wider area than the original hardware and makes me feel better. 10. Put a fender washer on the screw (I used two, to adjust for the screw length), and push it through from the bottom of the lid. 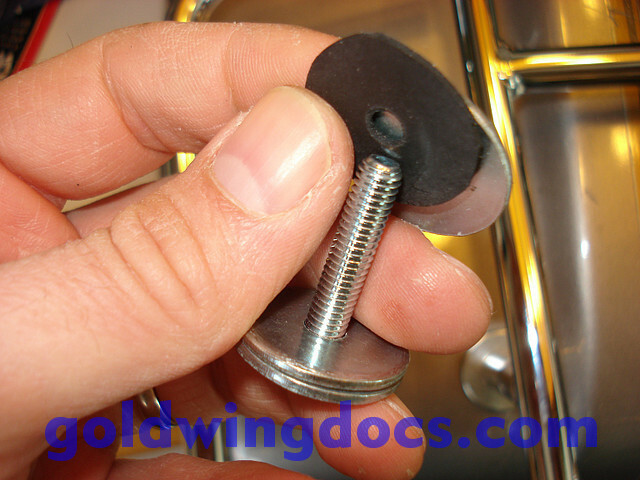 Then put the rubber washer down onto the screw, followed by another metal fender washer. 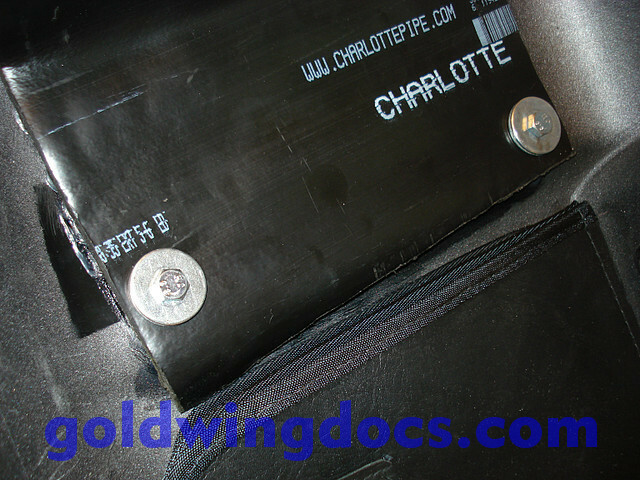 This compresses the rubber washer against the trunk lid, to keep it water-tight. 11. Start the threads by hand on each foot, then start tightening them a bit at a time (a bit on one foot, then a bit on the next, and so on). Tighten enough to compress the rubber washers, but not to damage the plastic (remember, this is relatively soft ABS you're working with). 12. The result: An extremely strong trunk rack that does not depend on the strength of the lid top to support it; instead it transfers the weight down to the much stronger sides of the trunk lid. Now go out for a long ride on some twisty roads to test your work - I consider this to be a mandatory procedure after doing any work on the motorcycle, no matter how minor! Make sure the old ABS cover is well-covered with cement first - that chemically melts the ABS, so that it bonds with the new ABS that you are adding to it. The result is not two pieces of ABS glued together, but two pieces of ABS that are bonded together - they have become one piece of plastic. I have thought about fixing those lower fairing mounts by embedding a piece of steel inside ABS, using the same slurry idea you mention. For those who haven't encountered ABS slurry before, you take an ABS pipe like I used before, and using a coarse rasp, shave it until you have a large pile of ABS shavings. Add ABS cement to this until you have a thick, black slurry of liquified ABS. You'll only have a few minutes to work with this before it starts to harden, so you may have to add more cement. This slurry can be used to fill gaps, cracks, or to fit odd shaped ares that need repair or reinforcement. Once it hardens, it has the original strength of a molded ABS part. If it is ABS, you can use abs cement? Right tool for the job so to speak... PVC cement is chemically not correct for abs. Go to Home Depot and buy a piece of black ABS sewer pipe. Cut it down the length, then heat it up in your oven until it lays flat (it will get to the consistency of soft rubber). For slurry, just buy the same ABS sewer pipe and a coarse rasp, and take the rasp to the pipe until you have a pile of shavings. Mix the shavings with ABS cement. If it starts to stiffen up before you're ready (and it will happen within a few minutes) keep adding more ABS cement. Labels: crack on the trunk lid corners of honda Motorcycle.